Hey everyone, hope you all had a very enjoyable weekend. Welcome back (and for my first time readers, welcome) to my arts and entertainment blog. This week I wanted to go over one of the new movies I saw recently, as it was something I have been waiting for ever since seeing the trailer released last summer. I am talking about Fantastic Beasts and Where to Find Them, the newest theatrical release from J.K. Rowling's world of wizardry. This is the first film released in the Harry Potter Universe to not have Harry Potter in it, so setting up a proper atmosphere and an interesting plot is vital. Ome of the ways the filmmakers were able to do this was by having the film take place in America instead of the usual United Kingdom scenery. Secondly, the film as based in the past as opposed to being present based, and it actually won some awards for the outstanding costume design. 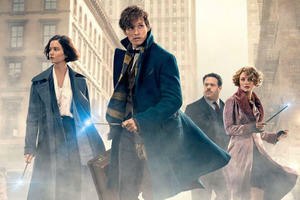 The film has Newt Scamander traveling to the United States in order to release one of his captured beasts in its natural environment, until his magical suitcase falls into the wrong hands and his creatures escape across the city. I thought that Fantastic Beasts and Where to Find Them was a great movie, that showcased how much else there is inside J.K. Rowling's world of wizardry. I loved seeing all the new creatures showcased, although the fact that it was done all with CGI made the creatures look more fake than in previous installments in this cinematic universe. The sequel is set to come out in 2 years with Johnny Depp reprising his role as the villain in the series, and maybe this time we will get to finally see him in a battle. Perhaps with a young Dumbledore?